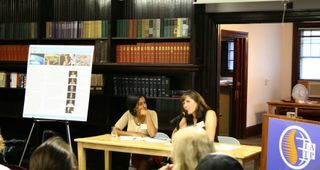 The facts shared at last night’s IATP event, “Climate Equity: Ensuring a Just Response to Climate Change,” were at many points staggering—at others, supremely encouraging. Dr. Cecilia Martinez and Fellow-in-Residence Shalini Gupta, from IATP’s Center for Earth, Energy and Democracy (CEED) hosted an event to discuss the inequity that exists within our highly inefficient energy infrastructure. As Dr. Matinez pointed out, our current energy system is often built on the backs of whole sets of populations, while those consuming the energy, and creating energy policy, see little consequence. Both internationally and within the U.S., the inequity between those that produce carbon and those that pay for its impacts, is real and widening. Dr. Cecilia Martinez credits this gap, among other things, to a highly inefficient infrastructure built on outdated, short-sighted and sometimes discriminatory ideals. She cited Robert Moses, the twentieth century urban planning giant responsible for much of New York City’s current suburb-oriented design. Moses’s tendency to favor highways over public transit did more than influence urban planners around the country—it separated communities from the inner city (often low-income) from those who could afford cars and to live in the suburbs. This energy-intensive transportation system still exists today and as Dr. Martinez pointed out: if modern policies are to succeed and ensure justice, they will need both physical goals (reducing carbon emissions, etc.) as well as social and political goals (improving a broken community infrastructure and ensuing equal access to energy). Shalini Gupta addressed the international issues surrounding climate change, including past and present proposals for cutting emissions. Who has rights to the atmosphere? Currently, in the U.S., we produce about 20 tons per capita annually of carbon emissions. India, on the other hand, a mere 2 tons per capita, annually. Gupta said, if the world was truly to be equal, carbon emissions would need to reduce to 3.3 tons per capita globally—quite a far off goal when you consider the currently proposed goals; the most aggressive of which comes from the Intergovernmental Panel on Climate Change which proposes reducing carbon emissions by 40 percent from the 1990 levels. Such a reduction would still only put the U.S. at around (conservatively) 11 tons of carbon emissions per capital annually. Among the daunting figures and historical injustices discussed at last night’s event, a thread of “Where do we go from here?” connected the problems with solutions. Efforts like Sustainable Energy Utilities (detailed in this article coauthored by Dr. Martinez) and the determination to push for diversified, small-scale energy solutions, can and will serve to not only reduce our dependence on a commodified, highly inefficient energy infrastructure, but will provide equity for those who have long been denied equal access to energy and energy independence. As Dr. Martinez put it last night, energy must be viewed not as a commodity, but as a commons. Learn more about SEUs on CEED’s SEU Web page. The concept for an SEU was developed by theCenter for Energy and Environmental Policy (CEEP).